The M6di really fills the engine compartment :-O. We ran it on the hose and it was indeed quiet even out of the water with the exhaust blubbing. It was so quiet that their tech was trying to figure out what the "funny noise was" only to realize it was just the sound of belts and pullies because the motor itself was so quiet that it didn't make any noise. It was also very quiet on the water. I’m betting the “funny noise” was actually the high pressure fueling system. It sounds like a belt/pulley chirp, but it isn’t. It is a mildly annoying noise that all the DI6.2s have. I have even gone so far as removing the belt entirely to make sure it wasn’t something in the accessory drive. The noise was still there. One of two things will happen- Either you’ll get used to it, and not pay any attention to it, because it’s not really a loud noise. Or, your OCD will not allow you to ignore it, and you will hear it whenever you are idling along, and it will annoy you every time. The good news is, they only have that light chirp noise at idle. It goes away above 1000rpm. I have to ask though, were you cruising with the wedge in lift? And what prop did you order? Seems like high RPMs for a big motor cruising at 25mph. Geez you guys are ruthless! IXFE is too predictable. (Funny and witty yes i admit!) But too predictable with the response LOL. Listen, I know its an upgrade from the old vinyl. I’m still deciding on my 2019 boat. (Weather here had been terrible for the entire spring limiting demo opportunities) I’m on a demo tomorrow finally!! 25LSV with Tanner from my local dealer. Awesome people! I love the new 25 LSV. Great boat! So I’m not here hating on Malibu. Ive owned a Malibu VLX and a 23 LSV. Both purchased brand new and sold at the end of season. 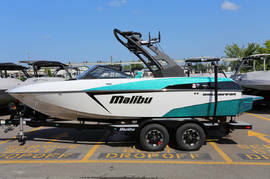 BUT if you take off the Malibu goggles for second and sit in a new Malibu, Mastercraft, Nautique, Supra, or Centurion and then HONESTLY ranked the vinyl 1-5 best to worst based on look, feel, and initial quality? Even though the new Malibu vinyl is good, i personally think they could do better. I’d rank Malibu last (again, just considering vinyl and thats it) Especially the threading - it still seems to pull apart easily. And it makes me mad, because they could do better. I reviewed your response in "G4 Tower? By Sride, July 14, 2015 in Modifications & Accessories " and saw the pictures you provided of the G4 Tower you had taken apart. I have a 2016 LSV25 with a G4 tower and I want dismantle the tower to complete some work on it. How did you know how to take the G4 tower apart? Are there any written instructions? Was it hard? Any suggestions and any warnings? If you have any other pictures, I would greatly appreciate them. John, could you shoot me your email address? Thanks. Can I please get the Illusion X PDF? No i can ship for about $25.